Traben Inspector is the best one-drop. Really! Patrick and Michael opine lovingly on Max’s mana base. He has these amazing lands! They come into play untapped every time. They always make the right color of mana! It is like he has twenty copies of City of Brass that never hurt him! Max’s deck has a low mana base of “only” twenty basic Plains. This gives him a disproportionate number of good draws in topdeck situations. In return, he “has” to play a ton of cheap creatures (so he can take advantage of the first turn, where he can slam a one drop with a very high level of regularity). Mike thinks Kytheon, Hero of Akros is obviously the best (at least it is the most powerful)… Isn’t it weird that there are three Dragon Hunters before the fourth copy of Kytheon? Traben Inspector is a 1/2 for one mana. This deck has lots of 1/1 and 2/1 creatures… The second point of toughness can be important for resisting certain kinds of interactions. 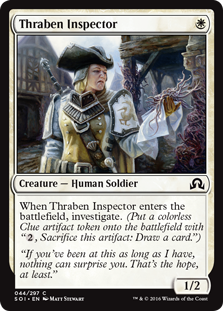 Thraben Inspector is a great way to use your mana early, and gives you useful things to do with your mana later in the game. Mono-White Humans is obviously strong, winning such a key tournament… But it’s not the only take. Tom’s deck is even more extreme! Twenty Plains was too many! Welcome to eighteen basic Plains! Mike is baffled that a deck with even more one drops than Max’s still only plays three copies of Kytheon, Hero of Akros… And Patrick tricks him into falling in love with one of Tom’s unique interactions. Always Watching is a new card from Shadows Over Innistrad that has already contributed to multiple new strategies. Always Watching is pretty much a Glorious Anthem with upside. 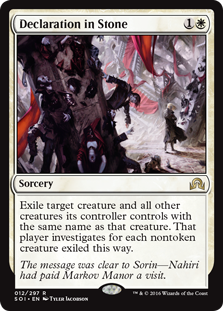 While the new take doesn’t buff token creatures (something Glorious Anthem did well in some decks), the addition of vigilance gives this card tremendous flexibility and play in Standard. 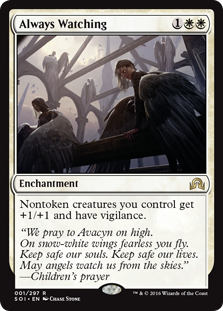 Archangel Avacyn might be the hot new Archangel on the block, but don’t count out the Magic Origins mythic rare… Especially with this new enchantment. Archangel of Tithes is awesome at holding off “go wide” attack decks, but at some point you usually have to attack to actually win the game. 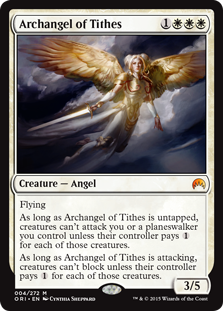 When combined with our new 1WW, Archangel of Tithes can get both sides of its text box… Attacking though still untapped. Dragonlord Ojutai probably didn’t need much help. While the Dragons of Tarkir headliner has been largely on the bench in recent sets, at no point did it stop being a supremely powerful Magic card. 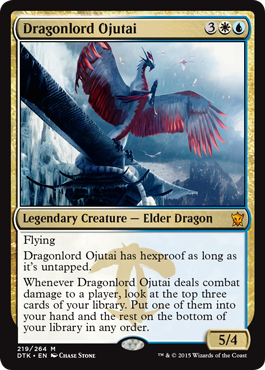 If Dragonlord Ojutai ever had a vulnerability, it was just that it lost hexproof when tapped… And the “Anticipate” ability only ever hit when you hit the opponent. Enter: Always Watching. When you play these two cards together you can get in with Dragonlord Ojutai… But never surrender hexproof. Oh, and Archangel of Tithes becomes 4/6 and Dragonlord Ojutai is 6/5 when played in concert with Always Watching. Here’s the thing: Always Watching isn’t even built for midrange control creature decks! It is actually going to be most effective (probably) with fast creature decks that can take advantage of a “go wide” turn three buff. … Ancestral Vision and Sword of the Meek were un-banned! So the jig was going to be up one way or another. The only question was whether Eldrazi Temple was going to be banned, or the Eye. Patrick makes a great case that Eye of Ugin was the “right” ban. While both Eldrazi Temple and our card at hand make for “Mox” mana draws for the Eldrazi, Eye of Ugin contributed to non-competitive games from both sides. The obvious one is any game where an Eldrazi player gets say three Eldrazi Mimics in his opening hand with Eye of Ugin… It’s just a ton of free mana on the first turn that can turn into an immediate kill. … But what about from the other side? It is also a Legendary Land. 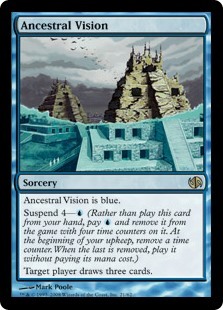 The power level of Eye of Ugin makes Eldrazi players want to play lots of copies of this card. So what happens when you only draw Eye of Ugins? Gross, right? Double-edged sword, sure… But if one of the two lands was going to get banned, Eye of Ugin is a good choice because it leads to bad play experiences for both Eldrazi decks’ opponents… And the Eldrazi players themselves (at least sometimes). 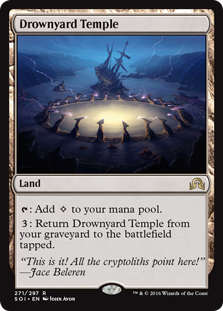 Plus: Eye of Ugin creates an Inevitable end game that is simply not desirable for a card that is also a Sol Ring. The banning of Eye of Ugin did not happen in isolation. In addition both Sword of the Meek and Ancestral Vision were un-banned. This podcast features lengthy discussions of both cards, their performance in older formats, and a ton of potential brewing ideas. All this and a “read the card” moment that (hopefully) an official Top Level Podcast fact checker would have caught. Can you find it? Maybe you* can be the official Top Level Podcast fact checker! * Just kidding. This is not a real position. Oh no! Patrick accuses Mike of keeping the true secrets of Declaration in Stone from him [last week]. How was Patrick to know that you could target token creatures??? It turns out Declaration in Stone is nuanced and has a lot of things going on for it. If you target a token — especially if there are lots of tokens of a similar type (say Goblin tokens) — Declaration in Stone is the best. You get to “Maelstrom Pulse” all those tokens and the opponent doesn’t get to draw any cards / investigate no matter how many tokens you smacked down. Of course it is great against big tokens too! Some kind of Marit Lage? Whatever 20/20… Declaration in Stone has you covered (and your opponent is still not going to be able to investigate). … But that is actually awesome! If the opponent is drawing lots of cards from a single Declaration in Stone that means that you got “a bunch of zero mana Forks” on your already awesome card that you wanted to play. That means that you are doing it. And so begins quite a unique episode of Top Level Podcast.